THE recent Influenza A (H1N1) epidemic is a validation that certain verses stated in Al-Quran and hadith, forbidding Muslims to consume pork, are not just empty words, said the State Mufti yesterday. Pehin Datu Seri Maharaja Dato Paduka Seri Setia Dr Ustaz Hj Abdul Aziz Juned highlighted this in his lecture yesterday at the Kampung Lambak Mosque in Berakas after mass Isyak prayer. "Al-Quran is full and filled with knowledge, and no one can compete with the knowledge of Allah (SWT)," said the State Mufti, adding that pigs are forbidden to Muslims because the Almighty knows the danger that it poses and can cause. Stating that there is a need to discuss the H1N1 outbreak, he reminded the congregation that in Islam, pigs are mughallazhah (things considered as najis or ritually unclean), such as dogs and pigs. According to the State Mufti, there are four different verses in Al-Quran that remind and warn Muslims of the danger posed by pigs. These quranic verses are in Surah al-Baqarah verse 173, Surah al-Maidah verse three, Surah al-Anam verse 145 and Surah an-Naml verse 115. "One of the verses explains that the reason pigs are forbidden to Muslims is because it is dirty," he said. The State Mufti explained that it is considered dirty because pigs contain bacterias, viruses and parasites that cause and carry various diseases. He added that once the viruses and parasites are transferred to humans, it can cause a variety of dangerous diseases or infections. Examples of some diseases that the State Mufti gave were Influenza A, a viral infection on the respiratory system; Japanese B encephalitis, a viral disease causing serious inflammation of the brain; stomatitis, which is a viral infection of the mouth characterised by ulcers and inflammation; and myocarditis, an inflammation of the myocardium (muscular wall of the heart or heart muscle). The State Mufti added that pigs are not only carriers of diseases and a host for bacterias, viruses and parasites, but they can also evolve and adapt itself to become more vicious and dangerous types of strains. It has been proven that the flu virus can adapt itself and be transferred to humans, he said, adding that this is what is currently happening. He further commented that the change of the infection's name from swine flu to H1N1 was to get rid of the negative image associated with pigs. These negative images brought up by the H1N1 flu has brought fear to many, up to the extent that it might bring about the slaughter of pigs, said the State Mufti. There are also fears that it will affect the pork product industry, estimated to cost billions of United States (US) dollars, he said, adding that regardless of the epidemic's name, experts have stated that the virus threatening to affect the world is a flu virus caused by pigs. Alex Smart Said: Brunei is a country for those who dont know.. 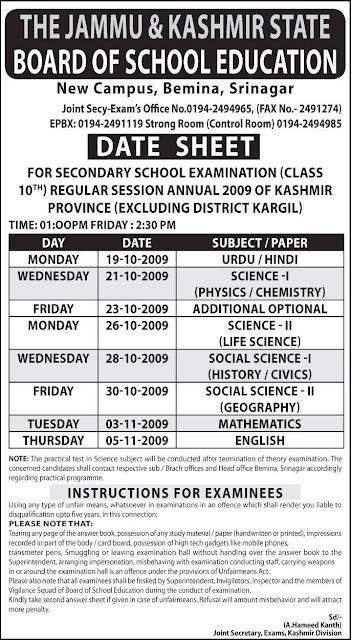 The Jammu And Kashmir State Board of School Education has released the final date sheet for the 10th class. Please Click on the Image for a clearer version of the Date Sheet! Alec Smart Said: Chus be Matric Pass Hasa Hey!! 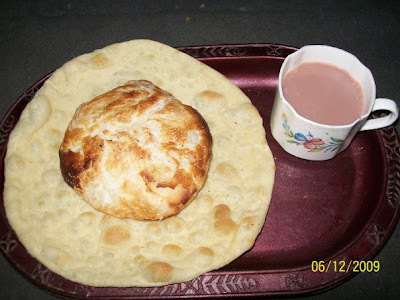 Moth Cham Diwaan Maas hasa Hey! 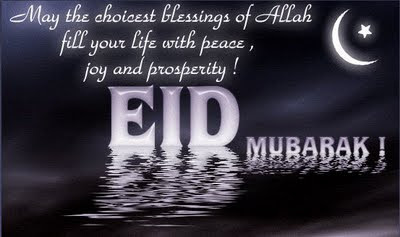 I am thankful to someone for this picture. I wouldnt mention his name though (if he wants me to mention, well I can..). I am also thankful to a reader who chipped in this comment in my earlier post on Omar Abdullah.. It was all grandpa's vision. Hindu Muslim Sikh Eesai Aapus mein hai bai bai. Hindu Son in Law, Muslim ...., Sikh Daughter in Law and Eesai Son in Law. Long live the family and the vision!!!! A picture is worth a thousand words.. Need I Write More!!??? 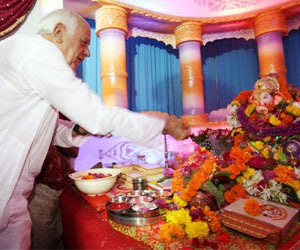 Alec Smart Said: Farooq is wishing EID MUBARAK to ganesha (the idol) and giving him EIDI.. Title: Omar prays for peace!!!! There are so many lines which are worth pondering upon by people like me.. So let me start! I maybe wrong (naturally) and I (as usual) may cause a lot a emotions to flow.. Let me start my article.. So nice of him, considering he is married to a Non-Muslim.. Case Closed..
2. Dargah Sharief, considered to be the epitome of spiritual blessings all over the valley. I dont think all the spiritual blessings are thrown there! Now why is it considered the "Epitome", when we know that Allah (SWT) is closer to us than Dargah is to the University of Kashmir..
(We are closer to him than [his] jugular vein 50-16). "You Alone do we worship. And You Alone do we ask for help." Always so interesting to see the words "administration" and "all-arrangements" in the same line. Case Closed. Ok! Fine! Maybe he did!! But its not gonna be answered anyway!! Bummer!!! 5.The entire Dargah Sharief premises was jam packed. Why wouldnt it be. It will Lal Chowk from tomorrow!! The song is too good, the rap and some moments in the video will make you laugh until you are dead!!! and then you may call that terrorismm.. (I Know.. Baad Joke).. So enjoy the ride and enjoy the sinowww!! Wear ur skieess and get set gooo!!! and if you know some other links please post them too!! Lets create a global platform for all of us!! Alec Smart said : " Mamoon, are you kidding me. You think someone reads your blog?" The One with all the clothes! So my exams have finished and my room is but a terribles mess.. My clothes are unwashed and.. -err have to wash them! I put all the dirty clothes at one side and things like date kernels, empty packets, empty coffee things, spoons, deos, combs, tissues, papers, pens, spiders, mosquitoes, mobile recharges, socks, snakes, and whales on the bed.. First mission completed.. Second to search every pocket for things such as mobile phones, 100 Rm notes, my friends, and my laptop.. Found a scissor in one and a watch on another... So far so good.. Took me 10 minutes to find my dynamo bottle! (Surph Excel for those in India!).. Oh no!!! Whats that!! My favourite jeans is torn!!! Cannot be!! Ah! There is a solution! Mom had given me a 'tsitchen pan daav" -(needles and thread) when I was about to leave for Malaysia a year before.. TADA!! I managed to sew it up!! Now my thumb doesnt want to stop bleeding! and my eyes are dizzy (a direct consequence of trying to put the thread into the needle) and my backs sore (i leaned too much when i was playing tailor-tailor).. Sigh! and i didnt do a really good job! It looks so wierd! Oh my jeans...!! Things to buy: 3 or 4 buttons to sew to my kurta! Apparantly the Indian style button tend to fall out and my kurta looks too vulgar... Oh my poor thumb!!! Alec Smart said: Dont tell his momma about this u nosy nosy people! !